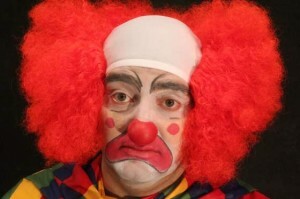 A Funeral for Clowns (Zanni Arte Productions) is a must-see at the 2012 Toronto Fringe Festival. Written by Vincenzo Aliberti and directed by Teodoro Dragonieri, this quirky, funny, and ultimately poignant show is about a funeral. It just so happens that everyone to grace the stage is a clown. The clowns themselves are whimsical and fun – especially Marcel Dragonieri who plays a truckload of characters coming in turns to pay their respects. He embraces each role completely, whether a clown drill sergeant, a clownish pilot on a scooter, or a mime. That said, the costumes are superb – appropriately over the top, yet still able to reveal character. For example, the funeral is attended by a “professional mourner” (Joanne D’Angelo) whose primary characteristic is that of a slick businessman. He sports a 1950s-esque wig, and a pencil-thin moustache. The audience-favourite was Noaman (Kat Letwin), who plays the narcoleptic, wispy-voiced, brother of the deceased. As the family of The Dead Clown (Geoffrey Armour) come up to the podium one at a time to say their eulogies – they enter into smoothly-transitioned flashbacks to reveal their relationship with The Dead Clown. It’s this kind of dialogue, and the character development in between, that makes A Funeral for Clowns the best Fringe play I’ve seen. The only drawback is the beginning of the play, that spends too much of its time with Mille (Valerie Cina) and Poppa (Isaac Kessler) arguing. The arguments quickly grow old, and seem to forget that the characters are clowns. Not that the clowns onstage are always hankering for a laugh – but even the most sentimental scenes are bursting with energy, and have something of the whimsical. A Funeral for Clowns is about memory, goodbyes, and both the sadness and humour in a funeral. It also asks a startling question. Who are funerals for – the deceased or the living? Thanks for very much for this review. I thought A Funeral for Clowns was brilliant, and so it twice! The cast was absolutely marvellous. But Aliberti’s play, blew me away, and I am having trouble finding out much about him – can you help? And why, oh why, wouldn’t this have been picked “best of fringe” it it in a whole other league than the other picks I managed to see. I did a quick search for Aliberti. He’s registered on The Playwright’s Guild of Canada, but I assume A Funeral for Clowns is his first play as there is little under his bio.